Ever since our trip to France Jen has been clamoring for a reprise of the rabbit stew with pastis that her uncle made for us. I know what you're thinking: is it possible for one person to clamor? Not usually but in this case, yes! 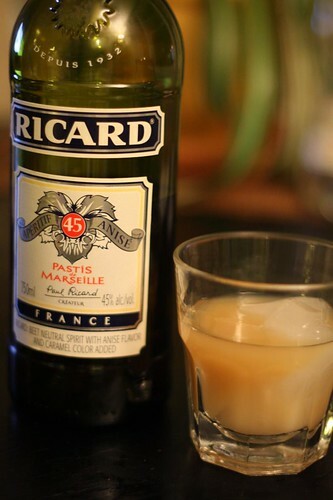 The best part of cooking with pastis is that I get to pour myself a glass which I can sip as an aperitif while cooking. Pastis is generally a very sneaky drink so I went with a very small portion. I cut up the rabbit into pieces (four legs and that weird back bit that looks kind of like a manta ray) then marinated them in olive oil, salt, pepper, and pastis for about eight hours. 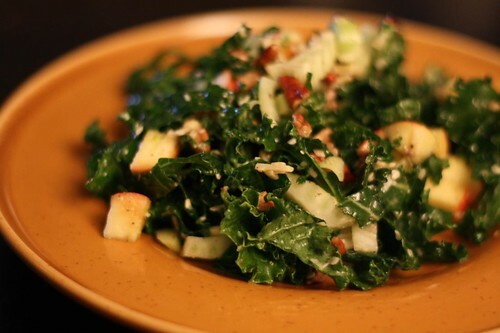 I started off by making a simple salad with kale, robusto cheese, lemon, cider vinegar, Pinova apples, and pecans. I purchased the Pinova apples largely because I had never heard of them before. If you own a grocery store near me and want to make a little extra money it's a safe bet that if you just rotate in a bunch of weird things that I'll wander in and buy them. Because I'm a fool. 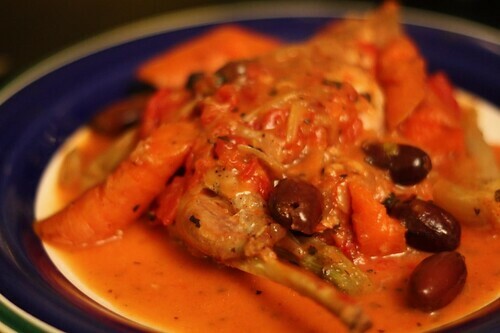 I removed the rabbit from the marinade, browned it thoroughly in a hot pan, then removed it and sauteed some crushed garlic cloves, chopped red onion, sliced fennel, carrots, kalamata olives, and a little dried basil. I also through in some chopped tomato and a bay leaf and let it simmer for about an hour and a half. Yes. Clive Owens eating a carrot. That, my friends, is the power of Google Image Search. 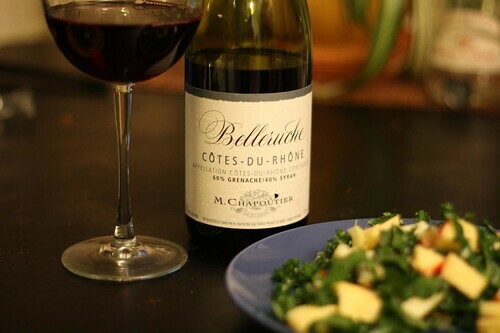 While I always lean towards beer I couldn't see that working with this particular dish so I chose this Côtes du Rhône from M. Chapoutier. Readers of the blog know that my wine-picking technique usually involves very little in the ways of country or varietal and a lot in the area of goofy names or labels. 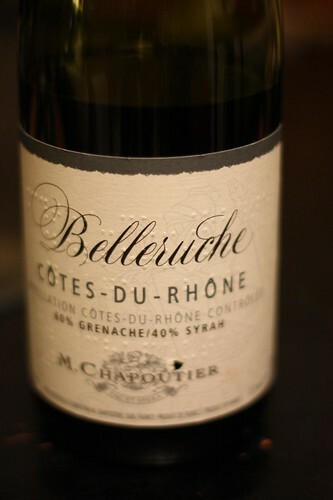 You may be surprised to see this wine picked as its label, and name, are of little consequence. Looking a little closer one notices that this particular wine's label is also printed in braille. I think this is great. There was a grocery store in the town I grew up in that had a braille sign on the entrance door. I always found that fascinating since there wasn't a single other sign in the entire city that had braille on it. I always imagined that a blind person could be wandering the city for years before they finally stumbled upon this one grocery store and only then would they get their bearings. I feel the same about this wine. If I were blind I could have spent all afternoon in the wine store feeling the bottles until I finally happened upon this bottle of reasonably priced Côtes du Rhône. Just imagine how disappointing that would be if I didn't really care for grenache. I believe I have seen the movie that photo of Clive Owen is from. He later uses that carrot to stab someone in the throat. Really? I hope you're not making that up because that sounds great! I am definitely not making it up, movie is called "Shoot em Up", great movie if you like gratuitous violence aka movies my Mum likes. If I remember correctly, the carrot throat stabbing happens within the first 10 minutes of the movie so you don't have to wait long. Was the grocery store Almacs?